Welcome To Day 20 Of Baking With Pumpkin! Today is one of my most favorite days of the week! Monday morning football!! There is also Tuesday morning football as well as Friday morning football around here…Got to love being a day ahead of everyone in the states. So football starts here at 2am and goes all day long on Mondays. I love it. Add baking to it and then it’s a perfect day. Sadly my Patriots game is tape delayed till this evening because they can only play so many live games at a time. I’ve had to so far avoid Facebook all day and have had a hard time avoiding seeing scores. Most of my family and several friends are Patriots fans,lol. Shortbread is kind of interesting to me. It’s more of a biscuit or cracker. It tastes amazing with tea or coffee, fairly easy to make. 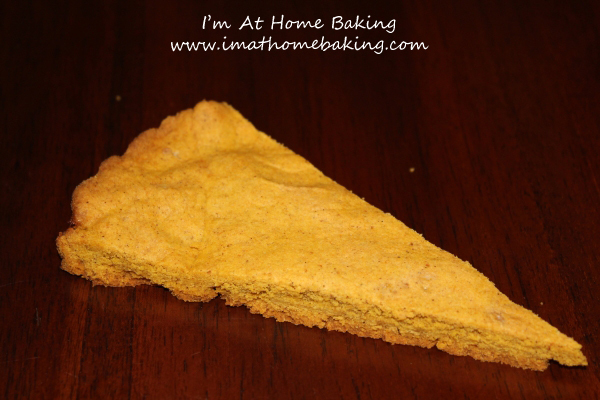 I would not call this a “traditional” shortbread recipe but it sure has a wonderful aroma and a great meld of spices for that perfect fall or autumn taste! For a softer shortbread, use a little more pumpkin and for a crisper shortbread use less. Bake for 80 minutes or until firm and golden brown. Immediately sprinkle top with sparkling sugar. Cool for about 10 minutes; remove side from pan. Use long, serrated knife to cut into wedges.